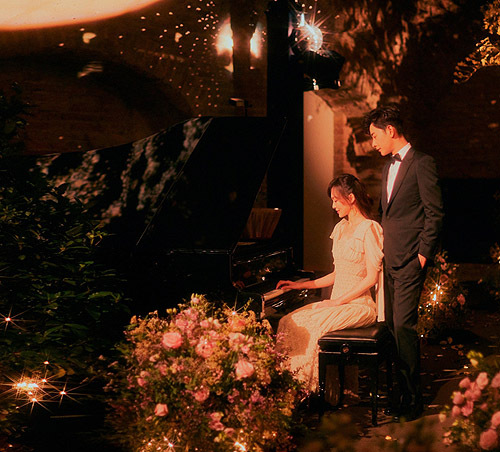 More photos of Tiffany Tang (唐嫣) and Luo Jin’s (羅晉) October 28th wedding were released today. 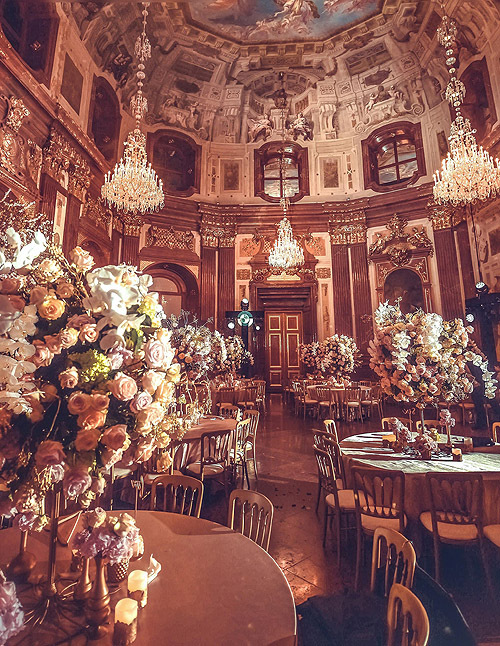 The Schloss Belvedere museum in Vienna, Austria was a perfect venue for the couple, who wanted a romantic destination wedding. 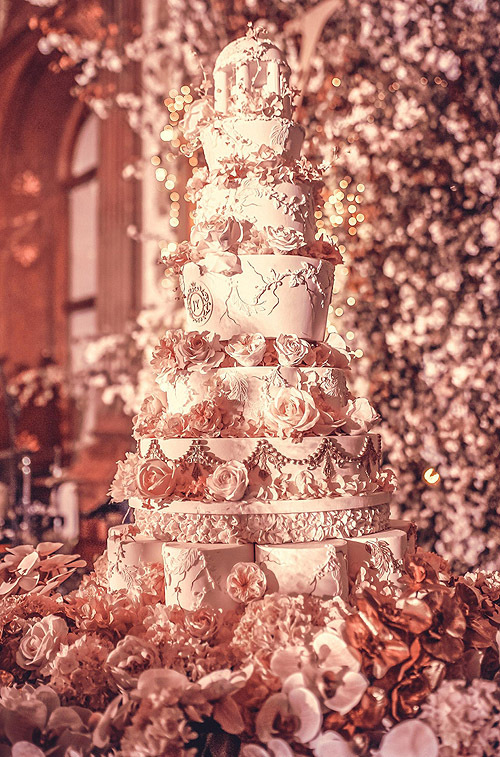 The venue was decorated with an abundance of silk flowers, giving the illusion of a rose garden. 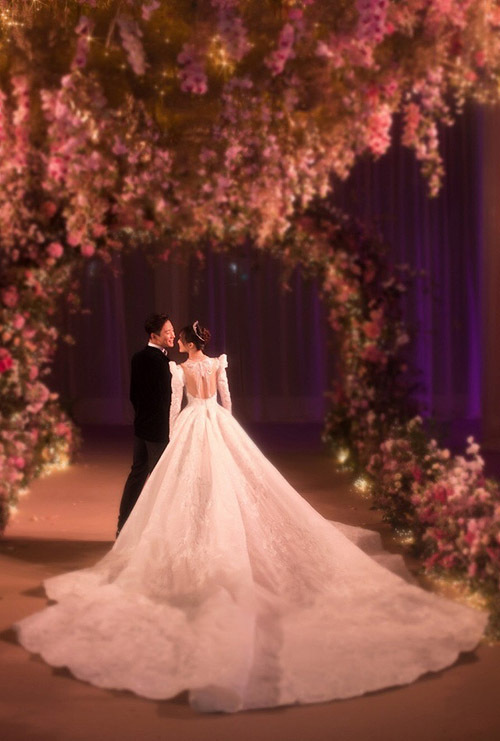 Tiffany’s long-sleeved wedding gown was designed by Mikael D, who also dressed Hannah Quinlivan (昆凌) on her wedding day. 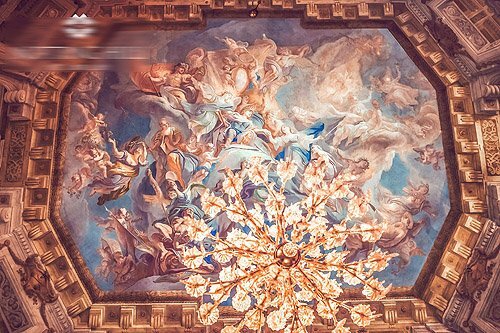 Arriving in Austria days before their wedding, Tiffany and Luo Jin took beautiful photos inside their hotel bridal suite. More great-looking photos were taken at their rehearsal dinner. Looking dreamily into each other’s eyes while dancing in a garden, the newlyweds’ were unable to contain their excitement to start a new life together. 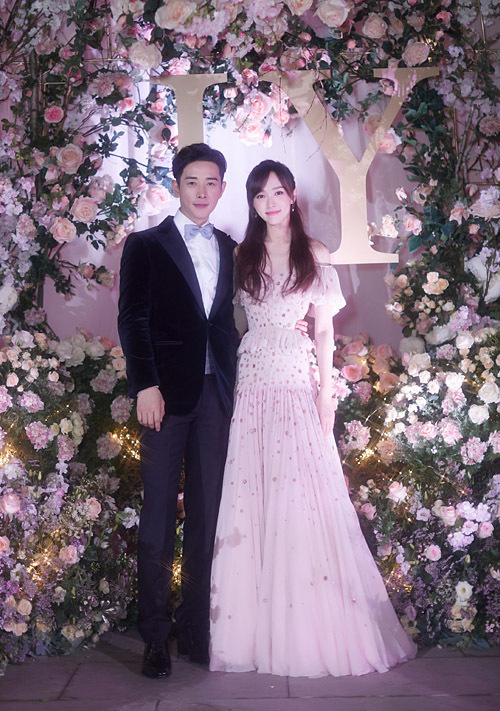 This article was updated on November 1, 2018 to include additional photos of Tiffany Tang and Luo Jin’s wedding. @littlefish agreed. The pictures look really beautiful compared to Christine’s whose photographer really ought to be shot. 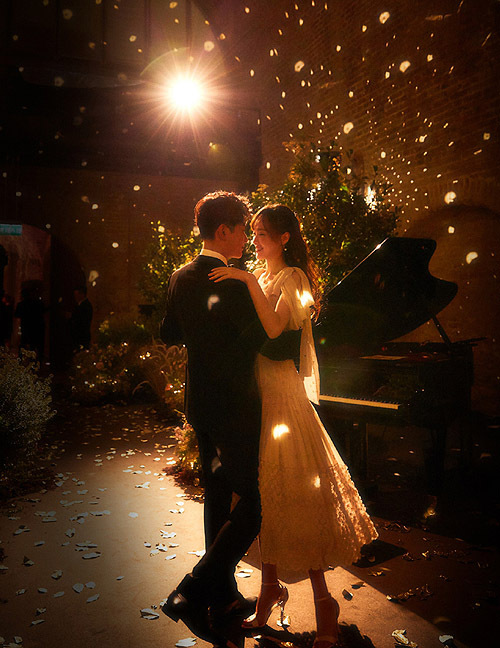 These pictures are really dreamily beautiful. @littlefish There are preggos who don’t show til 5 months. It’s different for everyone. @tiffany I know, however my point is they have planned this wedding way before any pregnancy. Pregnancy is just a cream on top for them, they would get there anyway, but they are planned to marry for tying to one another rather than because they are about to have children. So just because we suddenly hear about their wedding, it’s not because it’s a shotgun wedding, like ZLY and FSF. MY GOODNESS, I dislike that rumor too. Just because every celebrities are having shotgun marriages now, does not mean TY and LJ are having shotgun marriage too. Or if they are, at least there are no media play where she has to hide her tummy in every photos. And they both got their certificate around the same time of doing their ceremony celebration. So, they did prepared it well. How opulent! So classy and warm, definitely has a luxe feel, but not done in an obnoxious way. Just feels like two very happy couple finding a good photographing spot and taking great shots. They look so darn cute and glowing with love(the oh you’re so precious look they’re giving each other) and my god the pictures are so beautiful! Gorgeous wedding. 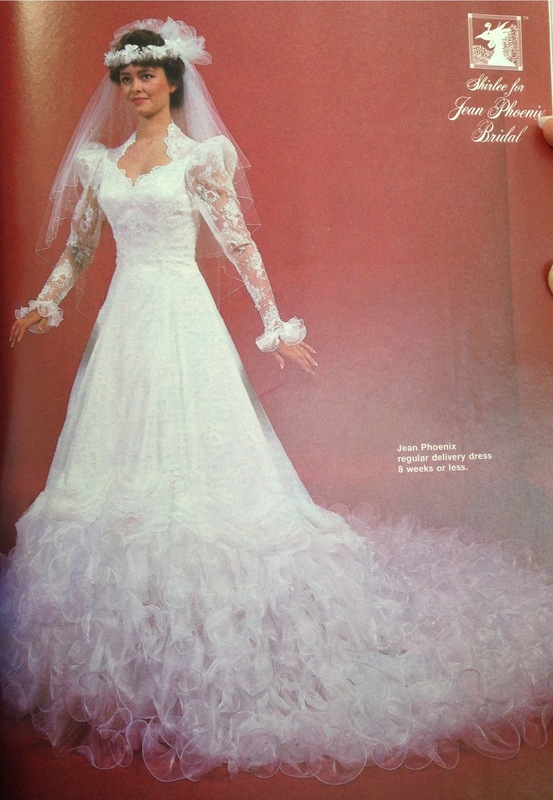 But the actual wedding dress is very old fashioned ,reminds me of the 80s sort. Never knew her taste is very nostalgic sort. I like her bridesmaid dresses even the traditional ones. This is a very well planned detailed wedding. If she’s pregnant should know by now because she’s so skinny. If she was going for princess style, she got it! 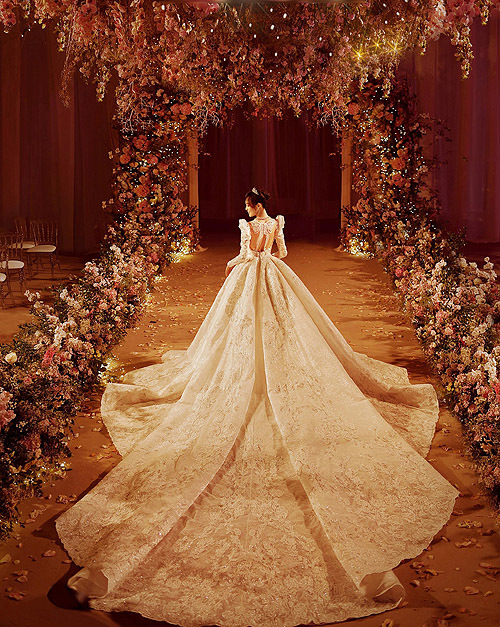 I’m not a big fan of the wedding dress (too extravagant? too costumey? too much? ), but overall, this is one of the best set of wedding photos so far. 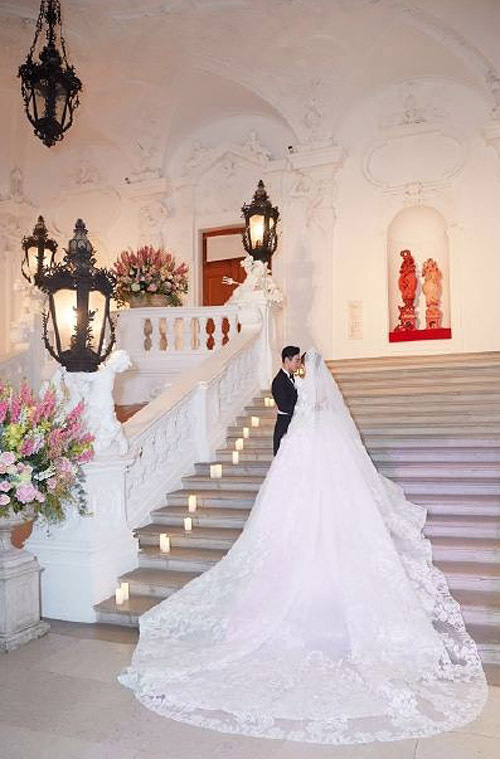 Beautiful wedding gown, fancy but elegant; and beautiful wedding photos! 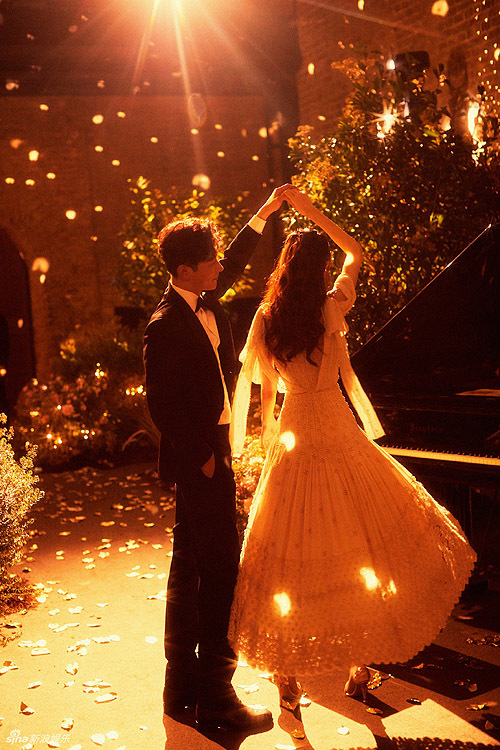 The pictures are so dreamy and romantic. The main wedding gown was a bit too over designed for me, but the other dresses were simply gorgeous. Congrats to them! Well, all the Chinese Paladin except Liu Yifei are married now ^o^ with interesting and great guy too. I did not know they were buddies too so great to know that. They are in the circle so would meet one way or another. Her dresses and the photos are very nice! I am glad they are finally married as they were an onscreen couple so many times. Glad they finally got together since it is fate. Another on screen turned to real life couple to add to the list. 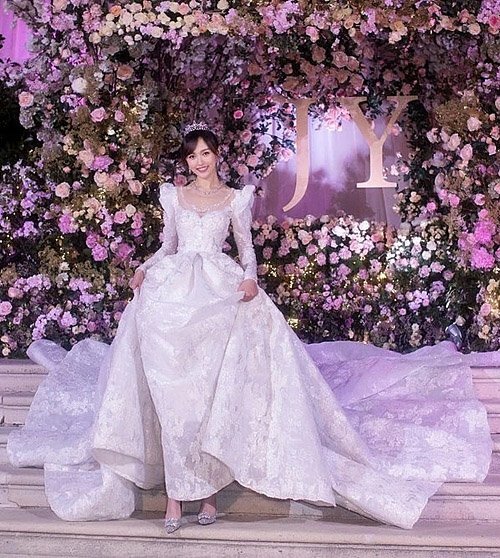 Yes all of the Chinese Paladin ladies are now married except for Liu Yi Fei. 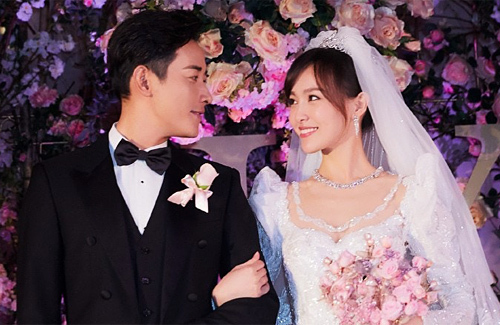 Now just waiting for the guys like Hu Ge, Eddie Peng, etc,to get married. Congrats to them! Hope they have a lifetime of happiness together. I always loved them together on screen so glad they have gotten together on real life.